Oxyprenylated secondary metabolites (e.g. phenylpropanoids and polyketides) represent a rare class of natural compounds. 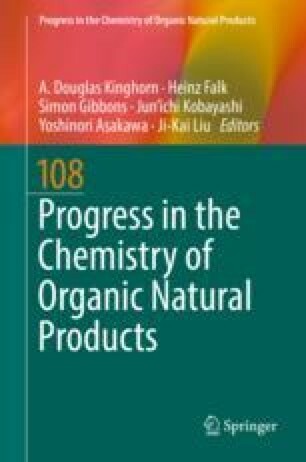 Over the past two decades, this group of phytochemicals has become a topic of intense research activity by several teams worldwide due to their in vitro and in vivo pharmacological activities, and to their great therapeutic and nutraceutical potential for the chemoprevention of acute and chronic diseases affecting humans. Such investigations have provided evidence that oxyprenylated secondary metabolites are able to interact with several biological targets at different levels accounting for their observed anticarcinogenic, anti-inflammatory, neuroprotective, immunomodulatory, antihypertensive, and metabolic effects. The aim of the present contribution is to provide a detailed survey of the so far reported data on the capacities of selected oxyprenylated phenylpropanoids and polyketides to trigger receptors, enzymes, and other types of cellular factors for which they exhibit a high degree of affinity and therefore evoke specific responses. With respect to the rather small amounts of these compounds available from natural sources, their chemical synthesis is also highlighted.